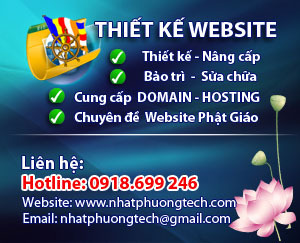 Ngày đăng: 16:59:35 07-10-2014-- Lượt xem: 9757. Kinh Diệu Pháp Liên Hoa- Phẩm Phổ Môn: Kinh này còn nhấn mạnh đến tầm quan trọng của Tín tâm (sa. śraddhā) trên bước đường giải thoát. Sau khi Phật giảng tới đó thì các vị Phật và Bồ Tát tuyên bố hỗ trợ kẻ tu hành để tăng phần tín tâm. Một phẩm quan trọng của kinh này với tên Phổ môn (zh. 普門品, phẩm 25) được dành cho Bồ Tát Quán Thế Âm. If someone can be liberated by a Pratyeka Buddha, he appears as a Pratyeka Buddha and teaches him the Dharma. If someone can be liberated by a Sound-hearer, he appears as a Sound-hearer and teaches him the Dharma. If someone can be liberated by a Brahma-heaven King, he appears as a Brahma-heaven King and teaches him the Dharma. If someone can be liberated by Sakra, he appears as Sakra and teaches him the Dharma. If someone can be liberated by the God of Comfort, he appears as the God of Comfort and teaches him the Dharma. If someone can be liberated by the God of Great Comfort, he appears as the God of Great Comfort and teaches him the Dharma. If someone can be liberated by a mighty General of the Gods, he appears as a mighty General of the Gods and teaches him the Dharma. If someone can be liberated by the God Vaisravana, he appears as Vaisravana and teaches him the Dharma. If someone can be liberated by a minor king, he appears as a minor king and teaches him the Dharma. If someone can be liberated by an elder, he appears as an elder and teaches him the Dharma. If someone can be liberated by a lay-person, he appears as a lay-person and teaches him the Dharma. If someone can be liberated by a minister of state, he appears as a minister of state and teaches him the Dharma. If someone can be liberated by a Brahman, he appears as a Brahman and teaches him the Dharma. He appears as a monk or nun, a layman or laywoman and teaches him the Dharma. He appears as a wife and teaches him the Dharma. If someone can be liberated by a lad or maiden, he appears as a lad or maiden and teaches him the Dharma. Or mahoraga, a human, nonhuman, and so forth, he appears accordingly and teaches him the Dharma. And if someone can be liberated by a Vajra-wielding Spirit, he appears as a Vajra-wielding Spirit and teaches him the Dharma. The Bodhisattva who roams throughout the world and appears in various forms to rescue living beings. Therefore you should all wholeheartedly make offerings to the Bodhisattva Who Listens to the Voices of the World. 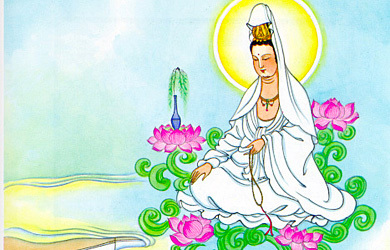 In times of terror, crisis, and trouble, the Great Bodhisattva Guanshiyin can bestow courage and dispel all fears. But Guanshiyin Bodhisattva would not accept the pearls. For the gods, dragons, humans, non humans, and the rest, accepted the rosary and divided it into two parts. One strand he offered to Sakyamuni Buddha, the other to the stupa of the Buddha Many Jewels. Infinite Resolve! With such sovereign spiritual powers does the Bodhisattva Guanshiyin traverse the Saha World. Several questions I would ask again.